My Chinese No-Chicken Salad is my go-to staple for filling up with nutrients, fibre, and volume with a relatively low number of calories. I add about 200 calories of Top Ramen, at least 300 calories from crushed almonds, and probably another 150 calories from my garlic sesame dressing. 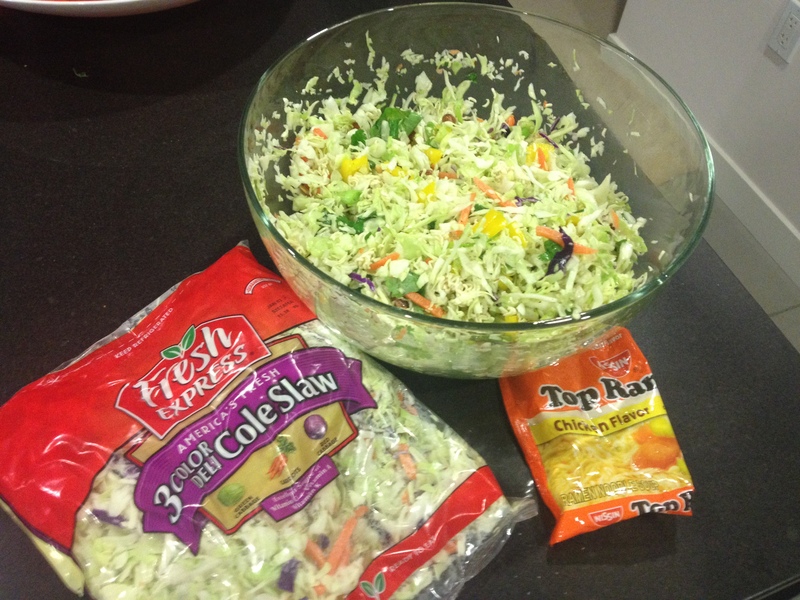 And, if you even bother to count it, the whole bag of cole slaw mix is 100 calories. I add chopped green onions, yellow bell pepper, and cilantro. So, that’s about 750 calories for the whole mixing bowl, which takes me about 1/2 an hour to eat in front of the television. Lately, I’ve been eating about 4 of these meals a week. Nice Blog! And this looks really good! Do you use the MSG packet from the Ramen too? Just wondering as that’s a lot of sodium. Thanks Indy. No, I save the MSG for other dishes 🙂 Don’t tell the McDougall’ers that I sprinkle the chicken-flavouring packet over popcorn. It’s really good, but it’ll probably kill me.